The consolidation roller on the Rake & Roll machine not only improves seed to soil contact for an excellent weed chit, but by carrying the weight of the machine it enables precise control of tine depth and a unique vertical tine action. The Tine height and angle are precisely and hydraulically controlled. Carrying the full weight of the machine on the roller means that the tines can work at a more vertical angle which leaves them free to vibrate and create fine surface tilth, rather than simiply providing a combing action. The FT roller is Tillso's patented technology, produced exclusively for Tillso by Otico. The non-block roller has a longer operating window in damp conditions, whilst the action of the offset indenting teeth consolidates deeper than just the surface. 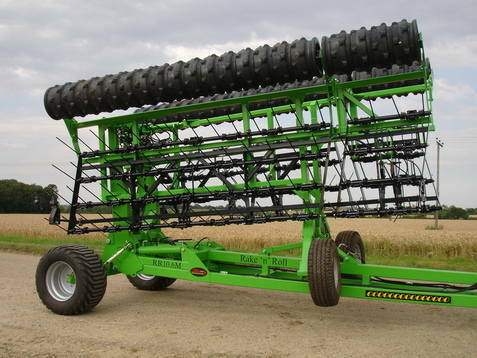 The flexible roller runs with a large contact patch which provides effective consolidation on stubble and at high speeds. This is in contrast to rollers designed to work in cultivated soil. Running the full weight of the machine on the roller gives a weight of around 600kg per metre. A comparison between a Cambridge roll and a flexible toothed roller can be seen below. 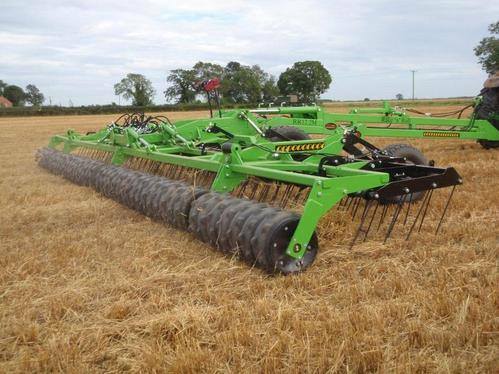 Minimising straw and chaff concentrations makes the following cultivations and drilling easier especially in reduced pass systems, as well as improving seedbed consistency and seedling emergence.The unique tine action effectively breaks up the straw matt. The R&R is a trailed machine which evenly distributes straw and chaff across the field, not simply combing it onto the headland. 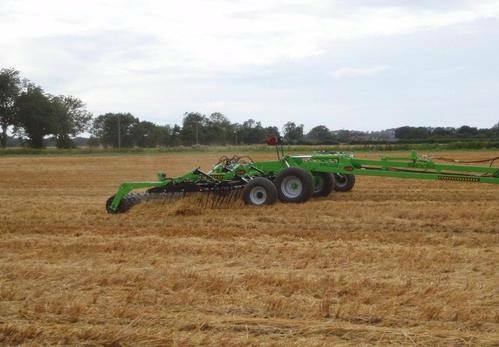 The combination of straw rake and consolidation make the R&R the most effective machine available to create a fast stale seedbed. The vibrating tine action shakes weed seeds out of the straw matt and creates fine surface tilth, consolidating them directly into this tilth for good seed to soil contact. This is important as subsquent rolling as a separate pass will not be as effective once the tilth has dried out. The effects of consolidation on germination are illustrated in the chart below from Monsanto trials on volunteer OSR plants. Blackgrass seed germination is affected by UV light, where light stimulates germination and helps to break dormancy. Black-grass seed dormancy is affected by conditions at seed maturation where hot and dry conditions produce low dormancy and cool and damp conditions produce high dormancy. By breaking up the straw matt, shaking the seeds out and thereby exposing them to light, the action of the R&R helps to stimulate early seed germination. Straw matts and burial of the seed will tend to encourage seed to germinate later in the growing crop and will contribute to increasing the weed seedbank in the soil. 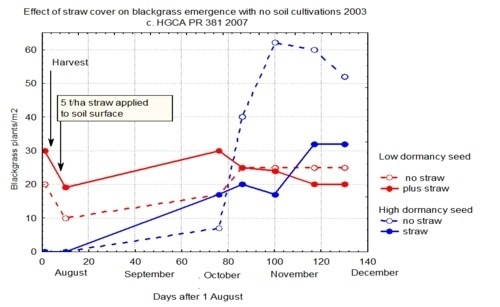 The effect of straw cover on blackgrass emergence with no soil cultivations as shown by HGCA can be seen below. This illustrates the benefits of exposing black-grass seeds to light rahter than burying them. 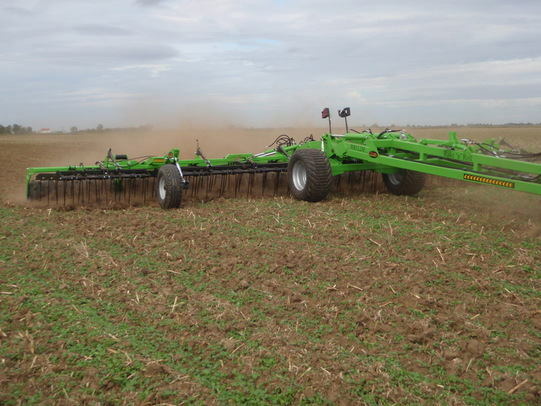 The R&R is used for seedbed fining and finishing before the drill, as well as for post-drilling consolidation and to enhance herbidcide action. 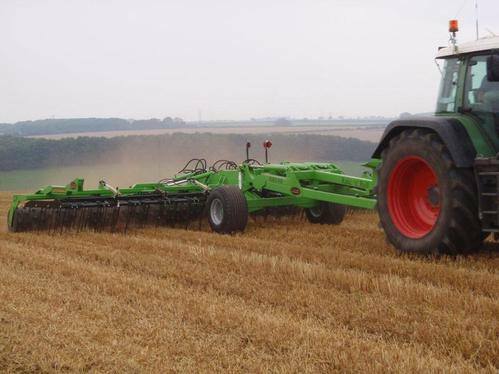 The R&R is also the ideal platfrom to establish cover crops, grass and OSR following a subsoiler or cultivator, or as a stand alone machine. Carrying the weight of the machine fully on the roller gives precise control over tine depth and angle which are hydraulically adjustable. The rake tines assist fine seedbed production, levelling and tilth creation, while the FT roller delivers consolidation equivalent to a light Cambridge roll and runs longer in damp conditions. The tine action disturbs slugs and slug eggs whilst the consolidating action reduces slug activity. Mounting a Stocks applicator or similar to the R&R makes it the ideal platform to apply slug pellets in a fast and accurate pass which can be applied during stale seedbed prepartion and before the slug activity has built up. The applicator can also be used to apply Avadex granules post drilling as another tool to combat black-grass. Tines 16mm dia. 16mm dia. 16mm dia. "We have had the Tillso rake for two years now and have found it even more useful than we would have imagined. Because of the very high black grass numbers we still make use of a stale seed bed to gain a chit of seeds. We tend to use a 2” shallow cultivation as our first pass to disturb slug eggs and encourage the chitting to start. This is followed with the rake two weeks later after a spray application has taken place. The soil has had time to weather now so this pass of the rake sets up another stale seed bed which encourages another flush of seedlings to grow. 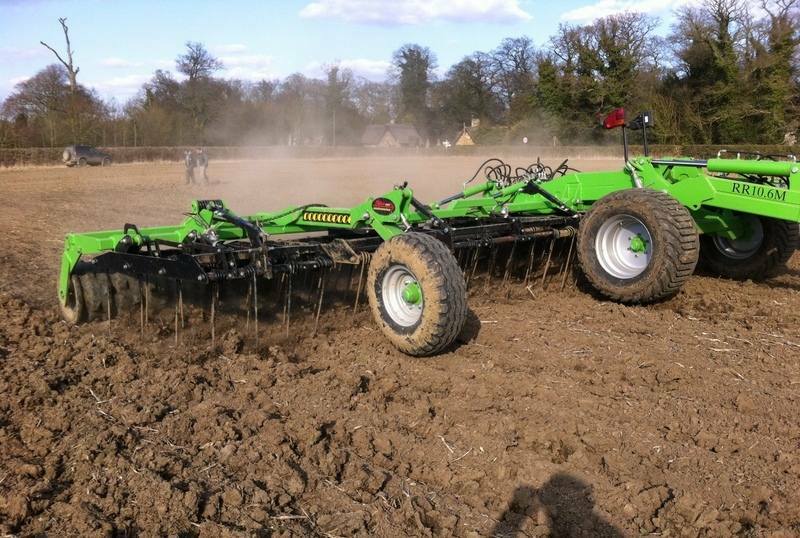 We use a 6m Claydon Hybrid Drill and we follow this with the Tillso Rake & Roll with Vaderstad Bio Drill box on to apply avadex or slug pellets. This is done at an angle to the drilling to help level out all the ridges. Then the rubber roller is able to help consolidate the soil over the seed. We have found that when we are drilling OSR in the wet, the soil can get too sticky on the paddle boards and cause problems with stubble bunching up blocking the drill. By having the Rake & Roll we have been able to lift the paddle boards out of the way for trouble free drilling. The Rake & Roll then comes over levelling the ridges at an angle to apply the slug pellets off the back of the rake which leaves them nicely on top of the soil." "The rake also does a very good job of tidying up harvested OSR fields where the sprayer has run down long stalks in the tramlines. Sometimes when harvesting late into the night in wheat we can find that the chopper doesn’t chop very well leaving a fluffy narrow row of straw. Again we just cross at an angle which spreads it out. We often use a 165hp JD tractor on the 12m rake which will travel up to 12km/hour, but 185hp means you can travel at 14-15km/hour."